The Pyle In-Wall/Ceiling Bluetooth Speaker Kit delivers effortless stereo sound to any room in your home or office. 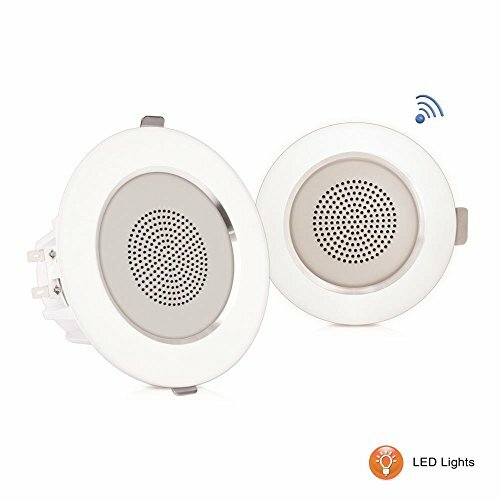 Each speaker features a built-in LED light and aluminum frame housing basket that provides an extra line of safety and heat-resistance. The included Bluetooth controller allows for wireless music streaming ability and doubles as a sound processing digital amplifier. You will be able to stream audio from all of your favorite Bluetooth devices (like smartphones, tablets and computers). Round style speaker design makes them perfect for any custom audio application on virtually any flat surface, without cluttering floor space. Integrated spring-loaded clips provide secure and flush wall mounting while stain-resistant grill covers ABS construction add extra appeal. Included cut-out template makes installation easy. Achieve wide-ranged wireless sound performance and add audio to any room with the Pyle In-Wall/Ceiling Bluetooth Speaker Kit with Built-in LED Lights.